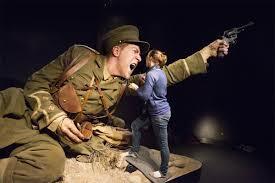 This (pdf) is a long review of the Museum of New Zealand Te Papa Tongarewa’s major commemorative exhibition, Gallipoli: The Scale of Our War. Since it opened in April 2015 the exhibition has been phenomenonally successful, both in numbers attending and feedback. But it left Dr Armstrong uneasy – in ways which will be familiar to critics of the commemoration industry on the Western side of the Tasman. The exhibition is also technically advanced, due to the work of Weta Workshop, which has perfected a species of massive but lifelike mannikins. There are six detailed sculptures of soldiers, doctors and nurses, plus lots of interactive, online, and ‘immersive’ components – the last apparently including immersive firing of weapons and immersive observing of their effects on human flesh. It will be interesting to see if this feature is also provided at Australia’s imminent Monash centre in Villers-Bretonneux. Armstrong attributes the popularity of the exhibition to the central place Gallipoli holds in New Zealand’s ‘orthodox national narrative’. This view has it that Gallipoli transformed New Zealand into a nation, so attending the exhibition is a form of pilgrimage not unlike the longer one that many Kiwis undertake to the real thing in Turkey. There is, however, an element in these pilgrimages of conforming with the received view, of even having it pressed down our throats – in ways that Kate Aubusson and James Valentine for Australia, and Michael Stipe for the world in general have also vividly described. Yet there are also deep family connections driving commemorative activity. Armstrong says the exhibition, despite the massive mannikins, has a claustrophobic feel to emulate trenches and dugouts. He has no doubt that the overall effect is to generate emotional empathy, but his ‘more enduring response [to it] has been one of unease at the degree to which that emotional response was prescribed‘ (emphasis in original). The viewer was being managed, manipulated. There was nationalistic identification, too: the Turks are ‘trying to drive us back into the sea’ (emphasis added). Punting for empathy like this, says Armstrong, drives out understanding. Critical issues such as the conditions and events that led to war or the broader strategic relevance of Gallipoli are addressed very briefly … Little is said about potentially controversial issues such as conscription or conscientious objection, or about the ways in which Gallipoli impacted life in New Zealand, then or since … Illustrating the horror of the experience of war is not enough and … “presenting the soldiers’ experiences and letting visitors come to their own conclusions” is certainly not enough. What is needed is clear, properly contextualised information about the past that will enable us to identify conditions and events in our own time that are analogous to those that cast us and the rest of the world into war a century ago, and to speak against them. In other words, we need history. * Dr John Armstrong is a Senior Historian at the Office of Treaty Settlements in New Zealand.